Jurassic World from Microgaming is the sequel to the Jurassic Park slot. The movie adaptation offers growling fun on the reels and the chance to win over 5 million coins in a single spin. 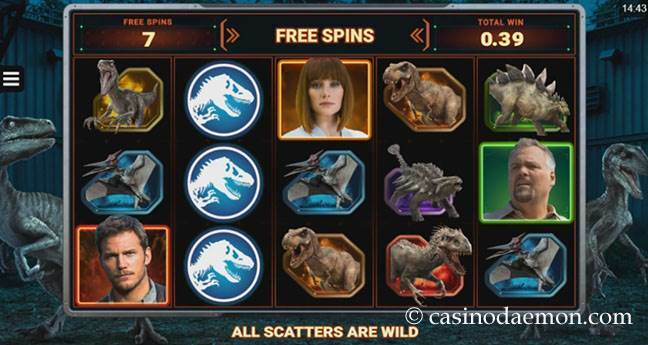 The graphics of the slot feature the scary dinosaurs and the movie's characters, and the background music and sound effects are keeping up the suspense when you spin the reels. The game has 243 way-wins, which means that winning symbols need to appear on adjacent reels and not on dedicated pay-lines. The special features of the slot include wild substitutions, the random Rex feature and three types of free spins with different special abilities. 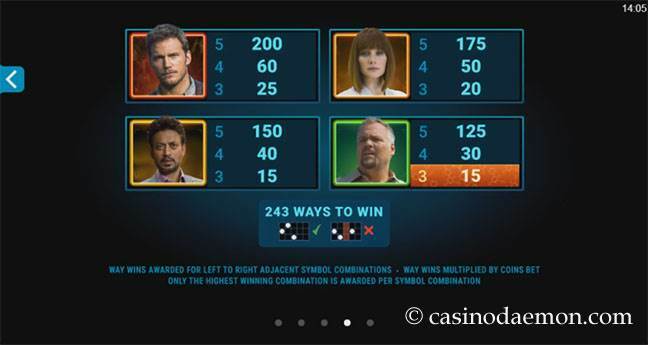 The variance of the slot is medium, and you will probably get regular winning combinations. As the free spins of the game have some special abilities to boost your winnings you can win a lot of money there, but the way-wins and the random T-Rex feature can also award some decent amounts. The theoretical return to player is 95.45%, which is average for an online slot. 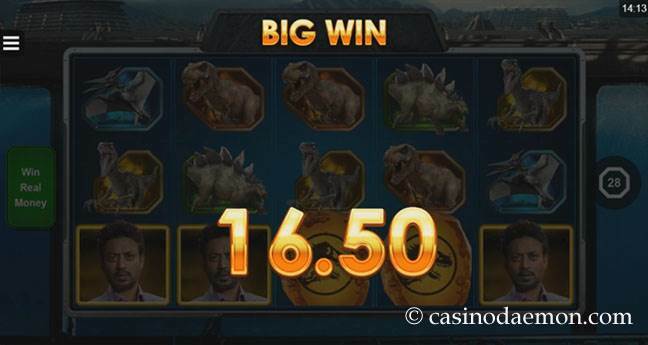 You can also play Jurassic World Slot mobile on many different devices. You can play Jurassic World for free here and try the demo version of the slot without obligation. If you like the game and want to play it for real money you can find it in the game selection of the online casinos listed on this page. Jurassic World has a few special features and symbols. The wild symbol with the T-Rex replaces other symbols for winning combinations, but it cannot replace the scatter. The scatter symbol shows the preserved mosquito, and if you get 2 of them on the screen at the same time they turn into wild symbols. Three or more scatters pay a win of the total bet played and start the 10 free spins. You can get up to 7 scatter symbols during the Raptor Den feature. There are three types of free spins that you can choose from. Gyrosphere Valley: the multiplier increases every non-winning spin and resets with a win. The free spins only end if the last spin was a winning spin, which means that they continue until you have a win. Creation Lab: symbols from winning combinations are removed and make room for new symbols, which means that you can get consecutive wins in a spin. Raptor Den: all scatter symbols also act as wild symbols and are held on the reels until additional free spins are won. You get 5 extra spins for 3 scatters. The Indominus Feature can randomly trigger during the base game. The T-Rex will then give you a random win of up to 1000x your total bet. 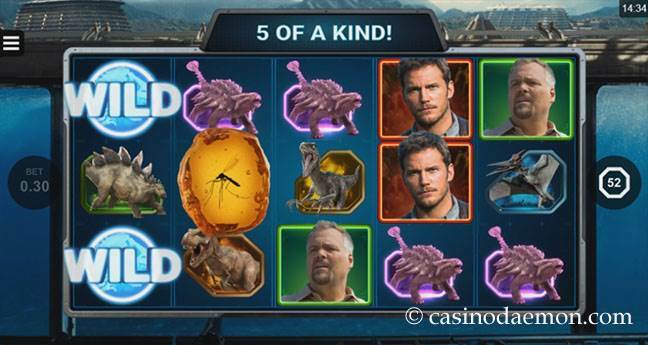 The Jurassic World slot has 5 reels with 243 ways to win. You can select coin values of either 0.01 or 0.02 £/$/€ and play up to 12 coins per spin. The minimum stake varies on the casinos, and is between 0.30 and 0.60 £/$/€ and the maximum bet per spin is 7.20 £/$/€. You can also select automatic play options.